Make blocks inspired by the sights & sounds of a day at the park. There are 8 hexagonal block designs - each of 7 blocks are made twice. The 8th block is made once to create 15 blocks. 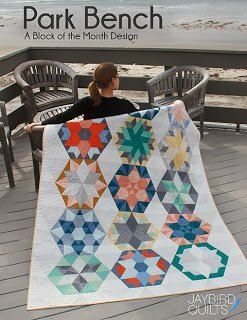 Creative fabric placement will make your quilt look like it has 15 different blocks. There are no Y seams! Each block will finish to 16". Finished quilt size is 65"X 88". Use a selection of light, medium, & dark fat eighths & fat quarters. Fabrics by Carolyn Friendlander for Robert Kaufman. Both Hex N More & Sidekick rulers are used. You can make templates from the pattern as an alternative.